Lately I have been riding my bike … a lot. As in all the way into the Brisbane CBD and back again to my home at The Gap. 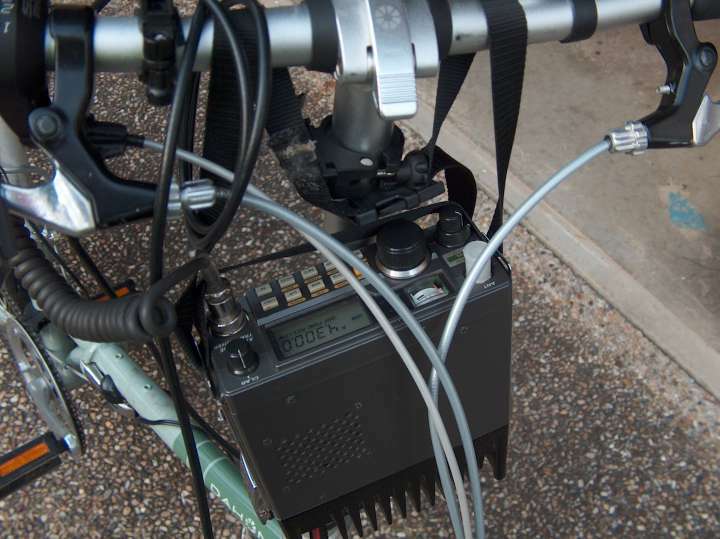 Lately, my handheld, a trusty TH-F7E has also given up the ghost… previously this is what I used when bicycle mobile — had that thing on the handlebars, and a small mobile whip on the back (which I never bothered to tune). The handheld worked well… even better when I had the headset interface working. However, SWR was high, and although my handheld never complained, my other radios did! With the handheld gone, I had to finally deal with this issue. The helmet that I previusly used too had also been replaced — with a new headset to go with it. Anyway… that’s a side issue. 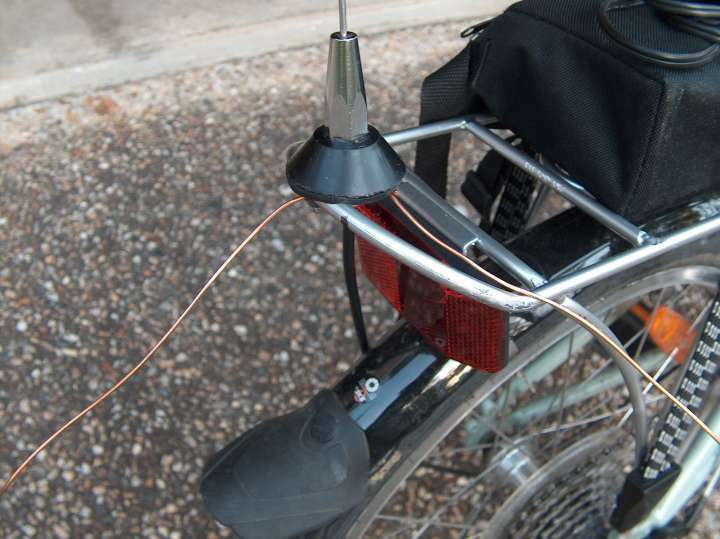 The big problem I faced was how to get this antenna tuned. The antenna is a tunable whip, basically just a length of stainless steel with a suitable mounting at the base — you cut it to the length you need to achieve resonance. Pretty simple. c=fL, and since hopefully most of the energy is going to be on the surface of the metal, and the metal is not insulated, it’d be approximately 1/4 of the wavelength (L). But what wavelength?? The radio I’m replacing the handheld with, is an old one… a Yaesu FT-290R II, which is an all-mode 2m radio. Since I have an all-mode radio, it makes sense to set up the antenna for all the modes I am likely to use. I don’t know CW very well, flat out decoding it when sitting comfortably at my desk, let alone whilst peddling up hills, so I’ll leave that to people like LY2KW. SSB and FM however, are definitely on the money. This is where the band plans come into play. 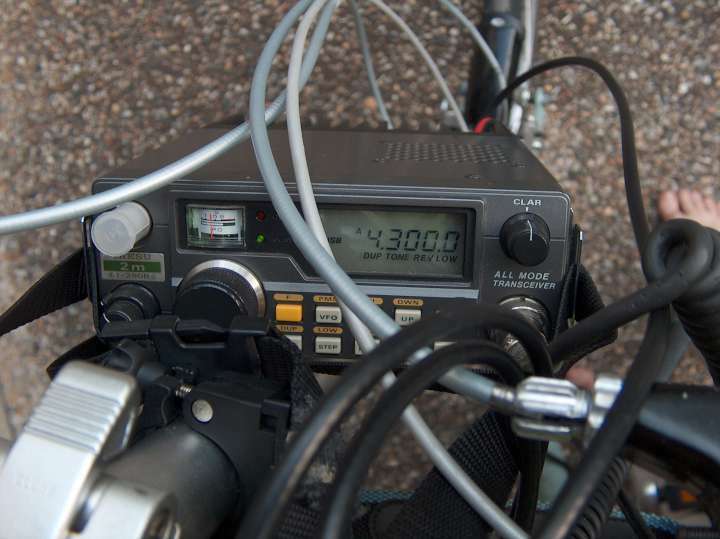 Here in Australia… the SSB portion is down the low end between 144.100MHz and 144.320MHz. Then there’s an all mode allocation between 145.225 and 145.775MHz. Everything above 146.025MHz is FM. The highest I normally transmit on 2m is 147.500MHz, as there are repeater outputs above this. Since I don’t know CW, the lowest I’m likely to go is 144.100MHz. So in order to balance this, I split the difference and used that to choose my resonant frequency… which yields a frequency of 145.800MHz, which puts me just at the start of the satellite segment. Hopefully SWR won’t be too bad everywhere else. So, back to the formula, c=fL. Plugging the info in, I got a wavelength of about 2.057 metres. So 1/4 of this … 514mm. Out with the hacksaw. Plugging in the radio, I found my SWR was still appauling… well… I don’t know my actual SWR, but the radio was telling me it wasn’t happy with it! The power amp on the FT-290R II (I have the FL-2025 25W linear attached) throttles back when it sees a poor match — and this is shown on the S meter. Okay… maybe I mismeasured… well it turned out that I hadn’t taken into account the fact that there’s about 30mm of metal at the base of the antenna holding it in place… so off that 30mm came. Tried again… still no good… doing an estimated 12W, which while respectable, it’s probably no good for my finals. Something else was the matter. 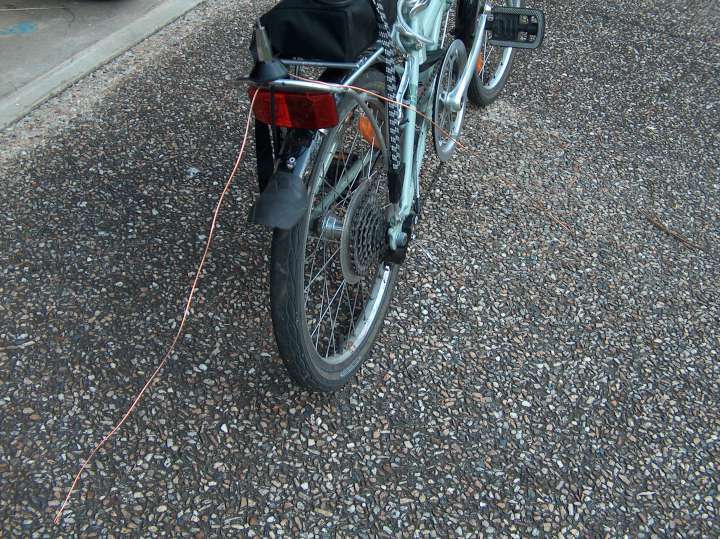 I did some probing around… yes, the shield of the coax was making good contact with the bicycle frame, but why was the SWR so high? I was hoping that the frame would make for a counterpoise radial. I knew it wouldn’t be a groundplane, but surely the frame being 1.5m long would count for something. As a hunch, I tried adding some lengths of copper wire to the antenna mount, connecting to the shield. Three of them extend 60 degrees apart, with one pointed straight out over the rear tyre. That brought the SWR down. So it seems although good contact was made, the aluminium frame made a bad counterpoise in other ways. The following is the new arrangement. Now, with that solved… I turned my attention to the radio mounting. I don’t have any mounting brackets, nor am I likely to get any, so that method was out. 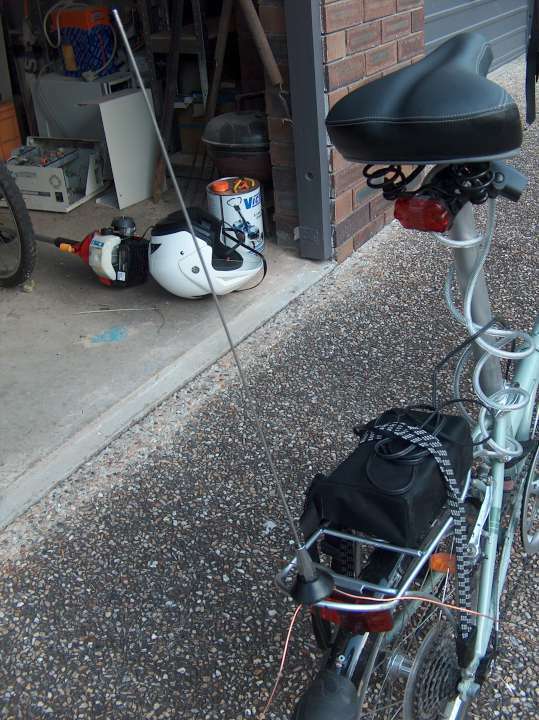 I had invisaged mounting it on the handlebars… well… I’ve sorta achieved that. This will need fine tuning. The FT-290 is intended as a portable rig, thus there is provisions there for a carry strap. 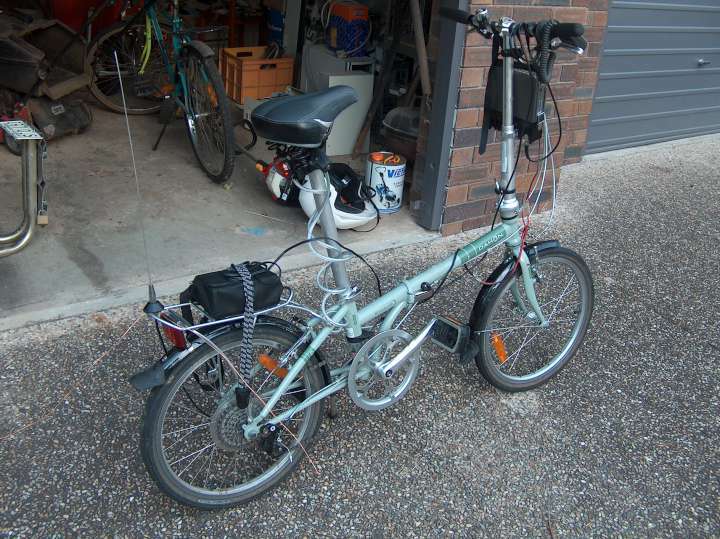 I’ll have to get a more suitable one, but I managed to find one that fits, and at least straps the top to the handlebars. This does mean the back of the radio swings… I’ll have to sort that out before long, otherwise one old radio is going to get battered and bruised. The strap loops over the top of the handlebars and around the steering post. It looks okay for now, but I know I’ll need to tweak this. The setup is almost complete… I still have to work on the mounting. 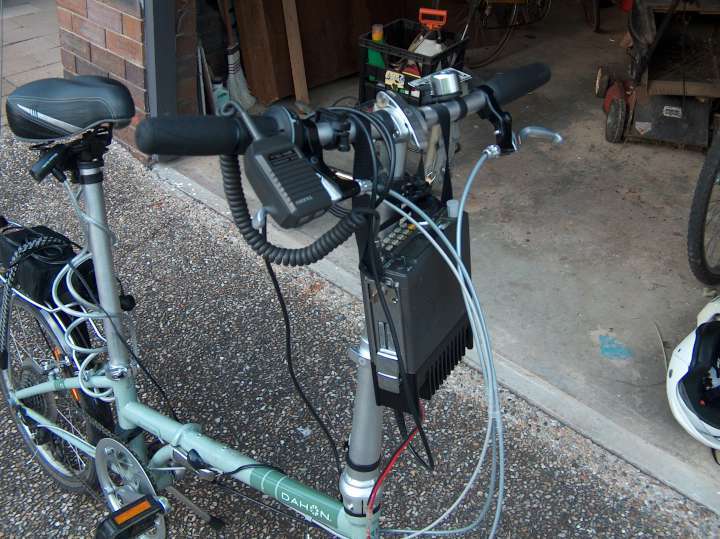 It needs to be quick-release too so that I can take the radio with me when I chain the bike up. Another option may be just to sling it over my sholder. The battery sits nicely on the back luggage rack — a 9AH SLA battery, plenty of life for this radio. The last piece of the puzzle is one of operation. You notice the handmic slung over the handlebars. This is very temporary, as I hate taking my hands off the handlebars when riding. I replaced my helmet with another open face motorcycle helmet, similar to those worn by Australia Post delivery people. Yes, overkill on a bicycle, but the visor already has prooven useful in keeping rain or low branches out of one’s face (yet to see a bicycle helmet with one) and the peak keeps the sun off well (again, most bicycle helmets are lousy at this). It also makes it very easy to embed a headset. The bike isn’t quite ready yet, but hopefully I’ll get something up and running this coming weekend. Then I shall be mobile once more. I shall report back once I have given this a try out proper. ever thought of using a mobile phone instead, they come with hands free now. He lived in the Bardon area around that time, I know that from discussions we’ve had on air.